Did you know that houseplants can really help to keep the air in your home clean and filtered? Your home or office might have something in common with a NASA spaceship, but unfortunately, this might be poor quality air. Various indoor pollutants that are commonly found in most homes and offices have been ranked as some of the top 5 environmental risks when it comes to public health. The stagnant indoor environments are prone to the accumulation of pollutants in amounts that humans shouldn’t be breathing in. Working and living in such conditions where there’s no decent ventilation and are rife with air contaminants can lead to the onset of sick building syndrome, which in turn causes nausea, headaches, dizziness, as well as ear, eye, and nose irritation. Fortunately for us, some NASA scientists have been working to better understand and find solutions to this problem. They conclusively gave out a space age solution that can be used by almost anyone: houseplants that clean indoor air. Indoor Plants, What’s the Deal? People typically spend 90% of their time indoors, and air quality is a very important element. Furniture, upholstery, cleaning products, and synthetic cleaning materials in our homes and offices produce toxic compounds such as formaldehyde. Besides these, other contaminants such as bacteria, molds, pollen, and outdoor contaminants like car exhaust fumes can cause indoor air pollution when they find their way into the building. This is usually made worse when the space is poorly ventilated. When potted plants are added into a room, it has been shown that they reduce the number of particulates in the air, though plants in bloom could be adding their own compounds. How Do Indoor Plants Clean the Air? Well, when plants are taking in carbon dioxide from the atmosphere, they absorb some of the particulates in the air. Through photosynthesis, the carbon dioxide is processed into oxygen. Furthermore, there are micro-organisms associated with the plants, which are typically contained in the soil, and are largely responsible for the cleaning effect to a huge extent. Aside from the air quality, houseplants have a therapeutic effect; they just make people feel better. Hospital patients who have plants in their room are generally more positive and had more positive results with lower stress levels and healthier blood pressure. Houseplants can similarly make people smarter by letting them stay alert and reducing their mental fatigue. Getting houseplants for your home can be quite intimidating, especially for those who have fear of commitment or a “black thumb.” Nonetheless, most plants are easy to take care of, and it turns out you’d actually need to try pretty hard to kill them off. In the next section, I have put together a collection of 9 hard-to-kill houseplants, ideally inspired by the research conducted by NASA. Every kind of houseplant has its own ideal environmental conditions, and it’s important to look for the tags that come with the plant or online in order to find out how much water or sunlight it needs. If your houseplant outgrew the previous pot or doesn’t come with a pretty one, don’t worry, you can easily re-pot it. Be sure to find a pot that is at least an inch larger that its previous container. Add the potting soil to the bottom and then place in your plant making sure that the top of the soil remains at about the same level as it was before. Finally, ensure that you pack the potting soil carefully around the edges of the plant and water it. 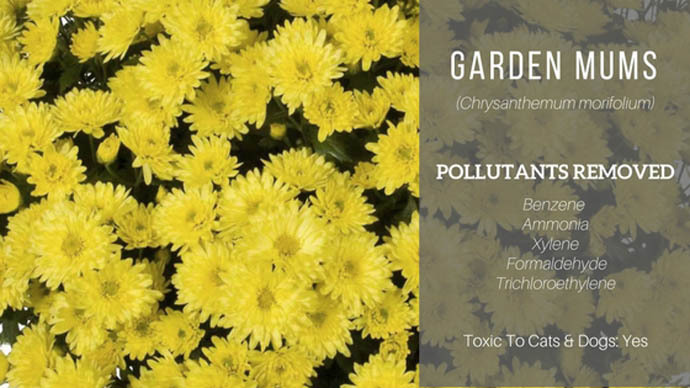 The Garden Mums (chrysanthemum morifolium) are bright fall flowers and are incredible at removing a great deal of pollutants from the air around them including benzene, ammonia, xylene, and formaldehyde. According to the research by NASA, Garden Mums are an air purification champion, and are quite a popular outdoors as well during autumn. Mums need lots of water, but just partial sun. These are some of the best houseplants for beginners or forgetful owners because they’re so easy to grow. Their ideal environment is under bright indirect sunlight, needing water only every few days. This means that in case you forget to water them for a while, they will be fine. 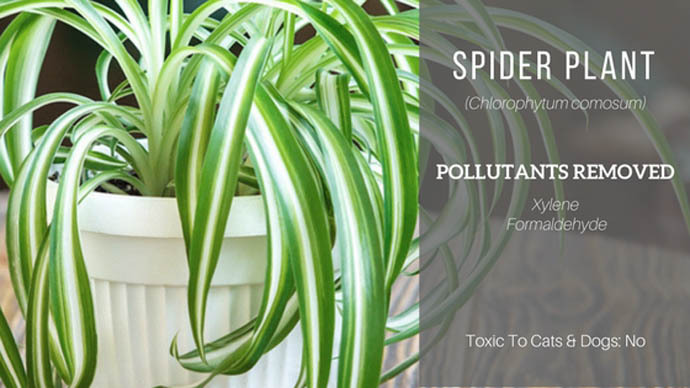 Place the spider plant on a hanging basket or pedestal close to a sunlit window to see the full benefits of lowered pollutants in your surrounding air. In no time, spider plants will send out flower shoots, which will ultimately grow into spiderettes or small spider plants that you can propagate by yourself. 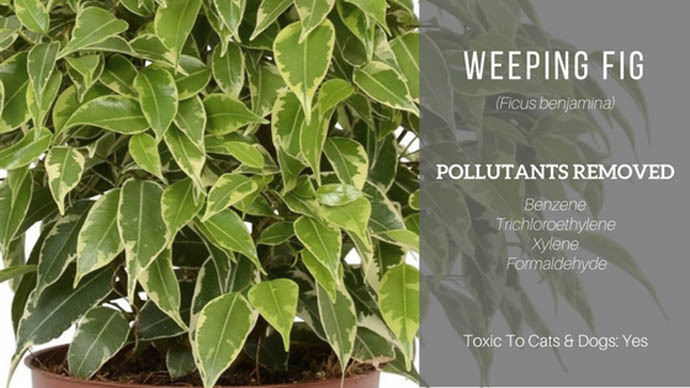 This plant is effective at removing xylene and formaldehyde. There are over 40 different types of Dracaena plants, so you can find the one that best fits your home or office. They are generally foliage plants with the long, wide leaves usually variegated with the lines of cream, white, or red. 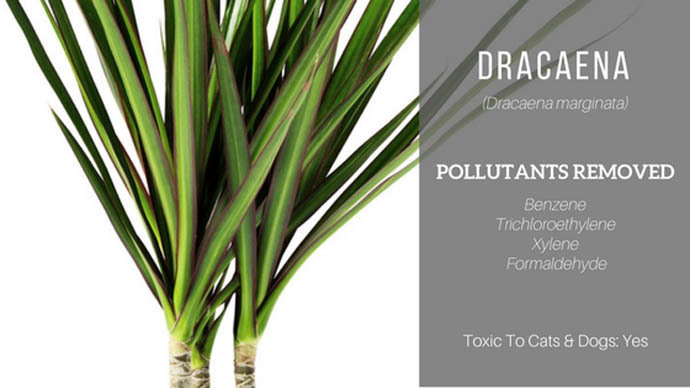 Dracaena is great for removing xylene, benzene, trichloroethylene, and formaldehyde from the surrounding air. However, the plant is toxic to dogs and cats, and if you have pets, you need to be extra careful about this one. Also referred to as that the Ficus, the weeping fig is a tree native to South-east Asia. When it’s grown indoors, it can grow to about 10 foot tall depending on the size of the pot it’s put in. 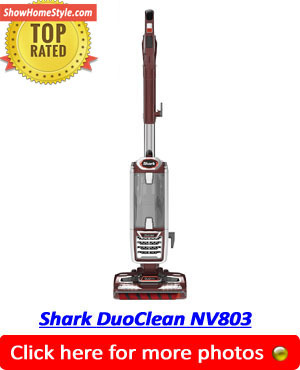 It works as a great air purifier, and it’s easy to grow and maintain. To keep it thriving, place it under indirect sunlight, water it occasionally, and make sure that the soil dries out between the watering. The plant can also be taken out during late spring and when temperatures become warm enough, be brought back indoors. Some of the pollutants it removes include: trichloroethylene, formaldehyde, and benzene. 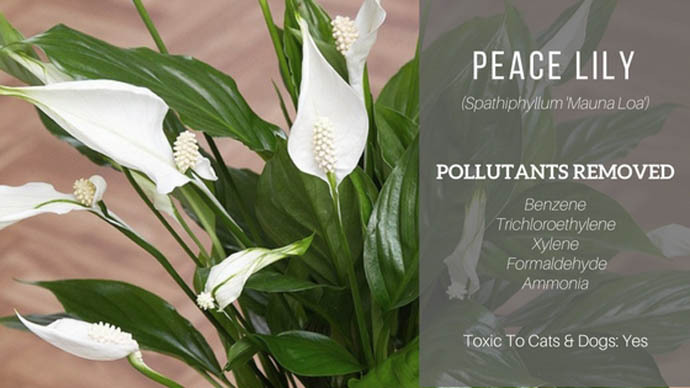 Although peace lilies are comparatively smaller than most of the houseplants on this list, they pack some powerful air cleaning abilities. They are also gorgeous, easy to grow, but tougher than they look and almost impossible to kill. They usually flower for much of the summer, and those flowers will contribute some floral scents and pollen into the air like all flowers. As such, you may want to avoid having many of them in one room. They are a perfect indoor plant for kitchens, bathrooms, and laundry rooms. It’s recommended that you put the peace lilies in shady spots, and avoid overwatering the soil. The airborne pollutants it removes include: benzene, ammonia, formaldehyde, and trichloroethylene. This is another type of houseplant that does exceptionally well in the bathroom, or other locations around your home with high humidity and indirect sunlight. They have not only been used to clean the air from a long time ago (first popularized during the Victorian era), but also make the place feel like a pre-historic jungle. The fern itself features a ruffy foliage that hangs readily. It’s easy to grow though it generally needs to stay moist. Be sure to check the soil daily to see if it requires extra water, and have it nicely soaked at least once a month. 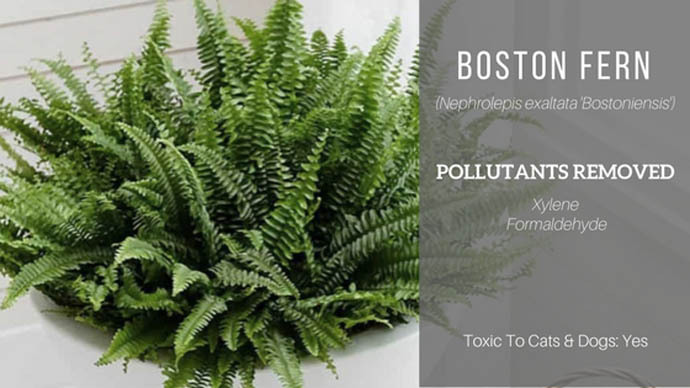 The Boston fern is an effective air purifier that removes pollutants like xylene and formaldehyde from the indoor air. The Mother-In-Law’s Tongue excels at purifying the air around your home and remains to be nearly impossible to kill. 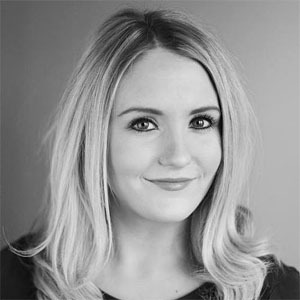 You’ve probably already seen it all over the place in restaurants and offices – this is usually for a good reason. The snake plant only requires water occasionally (about once per month), and actually prefers drier conditions. It doesn’t need much sunlight neither. This makes it super low maintenance, and is therefore ideal for the beginner or the forgetful gardeners. 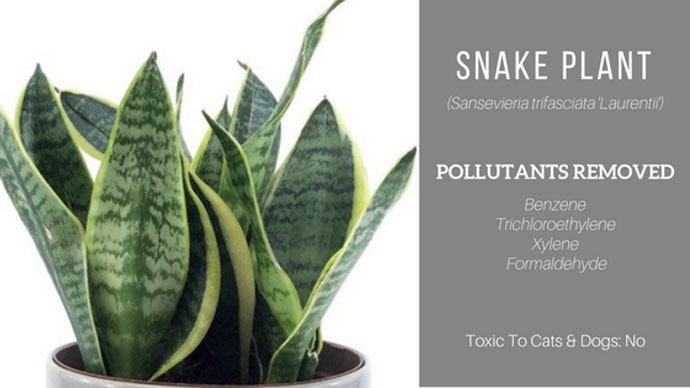 Snake plant removes formaldehyde, benzene, xylene, and trichloroethylene from the indoor air. Bamboo palms thrive in full sunlight, and could grow up to 12 ft. tall. 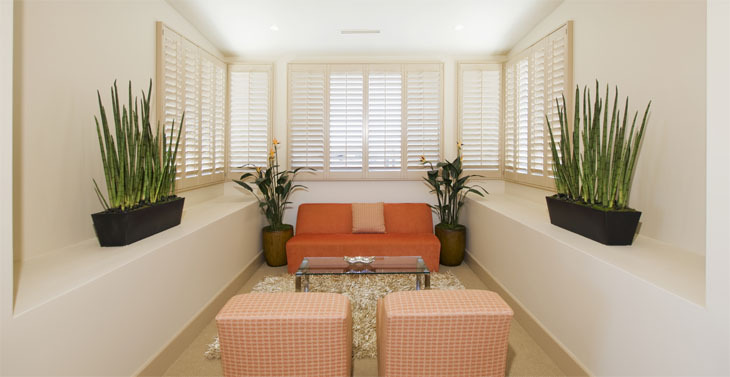 They are therefore great for the indoor spaces that have skylights and/or large windows. The tall, narrow trunks of this plant are renowned superstars for filtering formaldehyde from the air, and are a great natural humidifier, which makes them perfect for dry rooms. 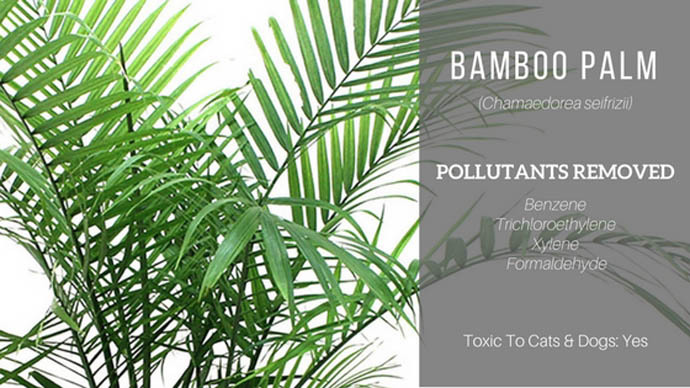 Bamboo also removes benzene and trichloroethylene. Aloe Vera is truly a multi-purpose houseplant. It contains a clear liquid that’s packed with vitamins, amino acids, enzymes and other compounds that have antibacterial, wound-healing, and anti-inflammatory properties. It therefore has great benefits by itself when consumed in small amounts, and is amazing for rubbing on rashes, burns, etc. 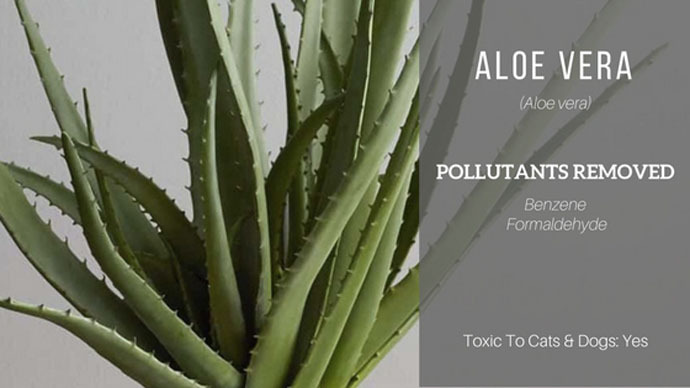 Aloe Vera is also effective at removing formaldehyde from the air. As a desert plant, it requires well drained soils, full sun, and very light watering. It’s worth finding out more about the things Aloe is good for, because once you do understand how beneficial it can be, it’s highly likely that you’ll want to have one in your home.